Failure is the first step towards your success. Yes, many great people be it Albert Einstein or Thomas Edison, they all failed many times but achieved their part of success. This is because they were honest enough to accept their mistakes and work on it. A Mistake done does not mean you fail and can’t do anything. It’s the mistake, which let you be true to yourself and pave the way for your learning. Honesty lets you avoid the re happening of mistake. Human tendency is to make mistakes and there is no harm in it. Just be honest about what you have done, accept your mistakes, not thinking about what people will think or perceive. Honesty is the only way to unwind your mistake to turn into your success. Be ready to learn from your mistakes and be true to yourself. Honesty does not mean you have to let everything pour out in open but it’s about whatever you ought to say is fully true. It’s not that Honesty guarantees success to all people. However, this does not even mean that dishonest people achieve success. 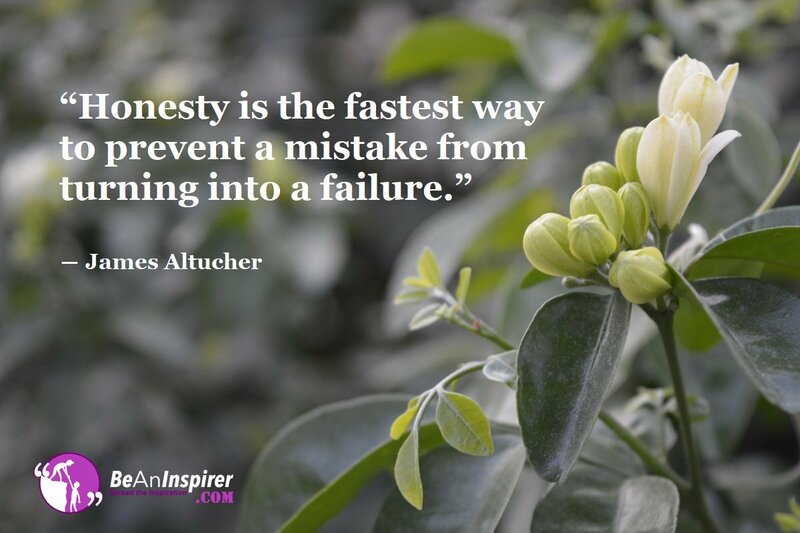 In fact, Honesty lets you achieve your share of success honestly. Imagine you being dishonest to your boss about your failure of presentation and later on he come to know about it. You would not be considered for promotion in that case. If you would have told him honestly about your failed attempt and accept your mistake, he would appreciate your honesty and be angry for a moment. Be true to yourself first then to others. If you are lying to your own self, you can never be able to be honest and truthful to others. Dishonesty would never earn you great relations. If being honest gets you less relations, never let them go, as they would be the most honest ones. The same way in path of success if deceit is the way you choose, it would never let you achieve your long-term goals. Honest people are admired and get in return their rewards but dishonest people always receive backlash. It’s your choice to choose what you want in your life. Prioritise your plan to reach the top ladder. Being honest to your mistakes will let you have no guilt for your actions. Even if you fail one time, two times or multiple times, if you are honest to it and accept your mistakes amicably, success will come to your door. Its matter of what is right and what is wrong. If you are honest to your faults and strive to not do it further, you would be the most content with what you have in life.